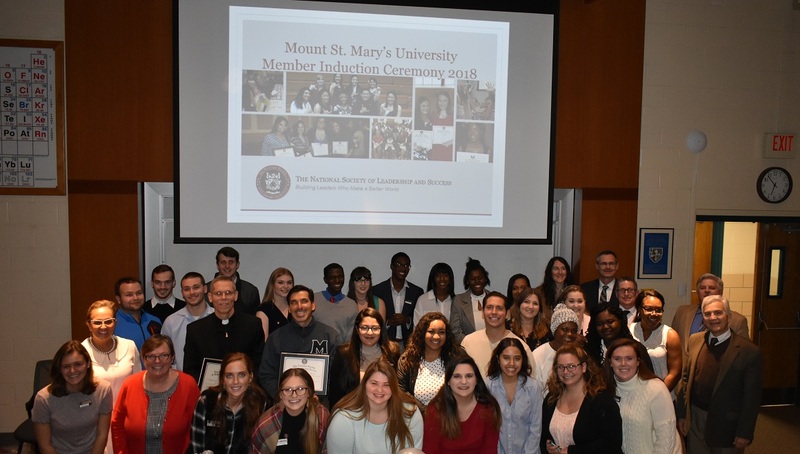 The Mount St. Mary's University chapter of the National Society of Leadership and Success (NSLS) inducted 36 new members in a ceremony on November 29. The Mount chapter has grown from 130 when it began in 2016 to 512 student leaders today. NSLS is the nation’s largest leadership honor society. The new members of NSLS are Kristen Akers, Birhan Alemayehu, Kikelomo Ayorinde, Samantha Barbato, John Bullock, Jordan Carpenter, Grace Crane, Rachel Delatte, Alec Edgerton, Benjamin Fisher, Chyna Gilmore, Michael Glynn, Joseph Graham, Sandra Granados, Calleigh Kearns, Kathleen Kunzman, Kylie Kunzman, Carrie Martin, Rachel Mattio, Augusta Mensah-Coffie, Zenabu Mohammed, Giselle Obiakor, Daniel O’Grady, Krysten Peterson, Robert Petrizzo, Austin Petry, Abby Rasinska, Elena Rittie, Emily Rivera, Brianna Rizzo, Gabriella Sacco, Brian Sagendorf, Ashley Singer, Kelsey Spisak, Juliette Nina Takoul Toukoulou and Andreas Tossah. Students are selected to be a part of the society based on their academic standing or leadership potential. Candidacy is a nationally recognized achievement of honorable distinction. Membership extends a variety of resources to students for building their leadership skills through on-campus or online participation, and provides lifelong access to benefits, including scholarships and awards, an employer job bank and personal discounts for students. In her keynote address, Vice President for Equity and Success Paula Whetsel-Ribeau encouraged the inductees to accept the opportunity and responsibility to make the world a better place as part of the 7 percent of people in the world with college education. That journey begins with knowing yourself, she said as she quoted Aristotle, "Knowing yourself is the beginning of all wisdom." In closing remarks, Vice President and Chief of Staff Wayne Green reminded the inductees that God has given each of them a unique talent. "We have an obligation to do, achieve and serve." The Mount chapter also gave awards recognizing individuals who are supportive of student leaders. Seminarian Jim Bors, Vice President and Chief of Staff Wayne Green and Associate Registrar Felicia Laux received honorary membership in the NSLS. Recognized for excellence in teaching were Alejandro Canadas, P.D., associate professor of business; Brian Gilchrist, Ph.D., assistant professor of communication, and Michael Hoover, lecturer. Vice President for Advancement Robert Brennan, Men’s Head Rugby Coach Jay Myles and Assistant Director of Admissions Lara Truitt received the Excellence in Service to Students Award. The Mount chapter, operated through the Institute for Leadership Ethics, Achievement and Development, hosts numerous leadership development events. The 2018-19 officers are Morgan Weigle, president; Kylie Kunzman, student vice president; Calleigh Kearns, secretary; Stephen Jackson, treasurer; Elena Rittie, success networking team coordination; and Katie Kunzman, social events coordinator.